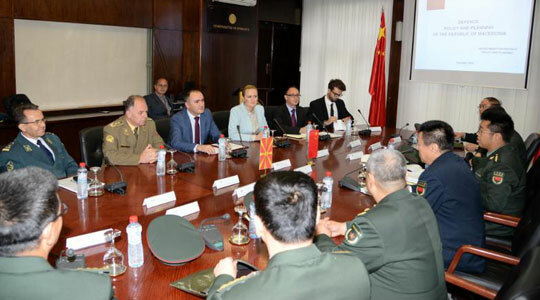 Deputy Minister of Defense Bekim Maksuti held Wednesday a meeting with a military delegation of the Chinese Armed Forces, which will be in Macedonia for several days. Deputy Minister Maksuti praised the high level of relations established between the Republic of Macedonia and the People’s Republic of China noting that bilateral cooperation was being fostered in the spirit of friendship, mutual understanding and respect, the MoD said in a press release. “Donations from the People’s Republic of China for Macedonia, the sending of Macedonian servicemen to study in educational centers in China, etc, set an example for excellent relations,” the Ministry said citing Maksuti. Vice Admiral Lee Yi, who is leading the Chinese delegation, thanked for the meeting saying the two countries fostered excellent defense cooperation, which must be intensified in the future. Sharing of experiences of the two armies and the ministries is in the interest of both Macedonia and China, he noted.